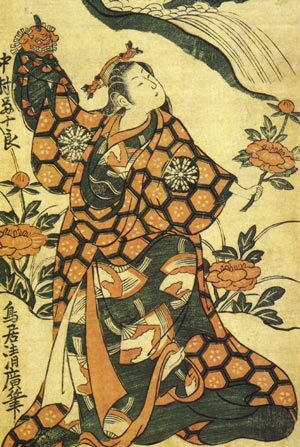 The dance "Hanabusa Shûjaku no Shishi" was premiered in the 3rd lunar month of 1754 in Edo at the Nakamuraza. The leading role of this dance was played by Nakamura Tomijûrô I and his performance was a huge success. The dance starts at a grand hall in a lord's palace, where a princess* is dozing, leaning on an armrest. There come butterflies and cause her to wake up. As she plays with them, she is gradually tempted into doing something, and begins to feel like dancing. She dances gracefully with yearning for slightly bitter love. Before long she takes two tiny lion's heads. Then she becomes more and more absorbed in the dancing. Finally she loses control of herself as the lions' heads take over her. She is pulled off the stage by the spirit of the lion. There follows an interlude in which young page-girls perform merrily sometimes with drams and sometimes with other instruments. After they have gone the music becomes intensively restless. After a while the princess reappears, but this time in completely another identity. It is no longer a princess. She is now a personified spirit of the lion. It dances dynamically in shishi no kurui Manner which depicts the state that a legendary lion plays around frantically. The highlight of this dance is the stark contrast between the princess's graceful dance and wild dancing of the lion's spirit, both performed by the same actor. (*) Depending on the production, the leading role is either a princess in her palace or a keisei in a banquet room of a pleasure quarter.